Title: My Name is Elizabeth! 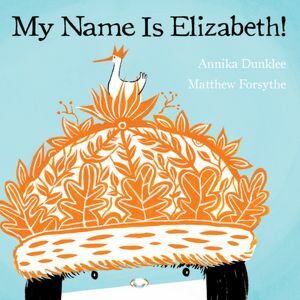 Opening Sentences: My name is Elizabeth. I really like my name. I like that it’s nine letters long. And I like all the neat things my mouth does when I say it. Note: The cover shows just how the illustrations are shaded throughout the book, harkening back to the days of Blueberries for Sal and similar books. Activities/Resources: There are name games for kindergartners, as well as many “name” book suggestions (including this book) at Mrs. Meacham’s Classroom Snapshots. There are reflections on the importance to a child of his/her name, as well as songs and activities at Kinderkorner. And finally, there are several items under the heading “Name Recognition” at the website Teach Preschool. Edited to Add: As Patricia pointed out in the comments, this would be a great book to start a conversation between parents and child about why the child’s name was chosen. Thank you, Pat! Availability: This was published just this year, in both Canada and the United States, and is readily available at Barnes and Noble and likely at local bookstores as well.